Image | This entry was posted in economy, government, inequality, labor, politics and tagged Economic Policy Institute, minimum wage. Bookmark the permalink. Arlen Grossman, one of the problems with our current tax code is that savings and investment are not rewarded. Savings and investment would improve quality of life for people if these people were given an adequate incentive. Many people seem to advocate a wealth tax. Do you have any views on that either way? Ragnar, I appreciate the importance of savings, but it strikes me that it is the rich who mostly benefit from investment. Considering the expanded inequality in income in this country, I believe a wealth tax is appropriate. Arlen Grossman, I am aware of what people on both sides of the political aisle will say on the issue of the minimum wage. On principle, I have no problem with it. The issue as I see it is the fact that conservative republicans do not see how it benefits them regarding their desire to reduce government spending in the long run. If you cut $7.6 billion dollars from government spending, the money saved from the reduction in government spending could go into the paychecks of people who are presently making minimum wage, which would not cause them to need food stamps, Medicaid or these other programs nearly as much. Another added benefit for these people is an opportunity to have more spending money as a result of increased take home pay. …and more money in the pocket of consumers to buy things and help the economy grow! Arlen Grossman, despite some differing opinions, this is an area that we seem to agree on. I’m glad to hear it, Jeffrey. 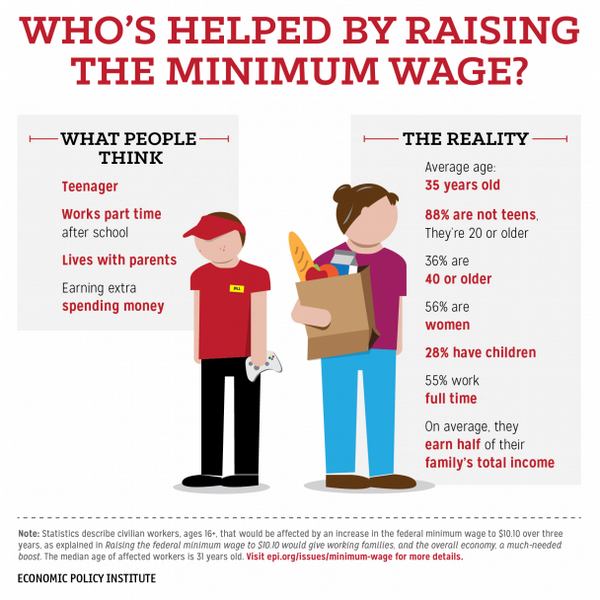 Arlen Grossman, this may or may not surprise you, however, I see no real issue with the minimum wage. Quite honestly, I would have no objection to its being increased if there is a reduction in spending on welfare programs. Another upside, if spending was reduced, these programs would be sustainable in the long run. One definite area of agreement we seem to have is that we both like David Pakman’s show. Despite my disagreement with him politically, I have enjoyed his Youtube videos. Sadly I doubt changing the minimum wage, or any law change, would result in lasting benefit for humanity. You may be interested in this documentary about a real solution Arlen.